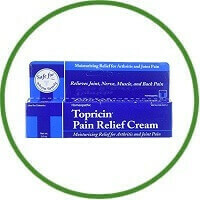 Topricin Homeopathic Pain Relief and Healing is the best homeopathic pain relief medicine that is manufactured in the United States at the highest quality standards. Homeopathic medicines are safe, gentle and help your body heal. They are safe for children (2-years and above), adults and the elderly. Will not interfere with any medication you may be taking. No odour or fragrance, no petroleum, no mineral oil, no lanoline, no capsaicin, no menthol, non-greasy, no-staining, and paraben free. Arthritis, Fibromylagia and other joint pain and discomfort. Carpal Tunnel Syndrome and other compression neuropathies. Pains and muscle cramps of the back, nick, should, legs hands and feet. First aid for simple trauma: bug bites, bruises, minor burns and strains.